It eliminates the danger of structural damage starting at the motor, which is beside the brake disc the major source of snag inertia load. At any kind of overload the inertia and the driving force of the (AC!) motor is separated from the hoist by the MSCII within one millisecond. 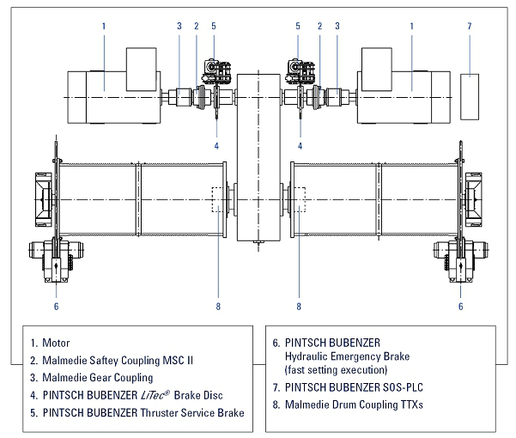 To reduce the remaining inertia coming from the brake disc, Pintsch Bubenzer LiTec® brake discs offering 60% less inertia than steel discs are in use.? 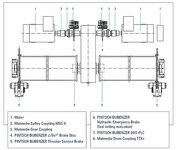 ?The special designed PINTSCH BUBENZER service and emergency brakes (fast setting execution) avoid at the same time a reverse of the rope drum. The reaction time of the system in combination with its own and separate PLC is ultra fast and completed, before conventional hydraulic systems are able to react.? ?Beside the advantage of having even less maximum rope forces compared to a conventional snag system, the system is much less in weight, low maintenance and cost effective. In addition and independent of the mechanical protection, the system is equipped with a so called Single-Rope-Protection (SRP). A second channel of the (usually mounted) load cells is used to permanently monitor the loads of each single wire rope ultra-fast. In case of overload of only one wire rope, the SOS-PLC closes the emergency brakes and the coupling will trip (speed dependent). By this, the development of Snag situations is detected even faster and on top, the system is redundant. Another advantage of the Single-Rope-Protection: At empty spreader operation (detected by using the twistlock signals), the trigger point is set to an even lower value, because the max. rope loads are much less on empty spreader operation compared to load operation. Result: Even earlier and faster protection in Snag situations with empty spreader! ?